The lake offers many different marine sports, fishing options, shops, and restaurants to enjoy. There is great hiking close by and great lookout points for those looking to catch a glimpse of Mt. Fuji on a clear day. This Amphibious bus takes you on a tour of Yamanaka, and then drives right on into the water for a different experience altogether. Amusement park with attractions that have appeared in past editions of the Guinness Book of World Records! “Thomas Land” is very popular with children. 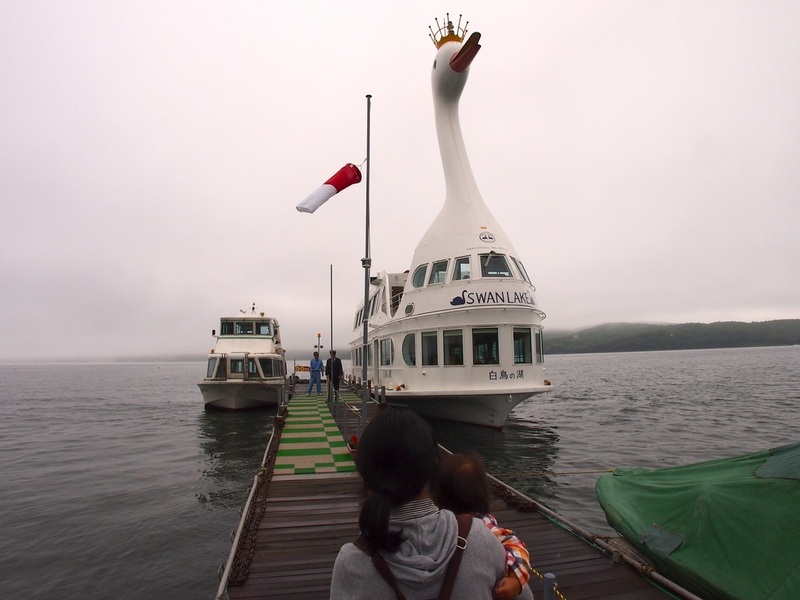 This swan shaped cruise boat takes tourists on a tour of the lake where you can get a great view of Mt. Fuji on a clear day. The entire round trip takes approximately 35 minutes. Stunning flower gardens that offer fields of seasonally blooming flowers as well as wonderful views of Mt. Fuji on a clear day. Seasonal favorites include the tulips, cosmos, and sunflower displays. An aquarium specializing in freshwater fish. The facilities include a variety of fish tanks as well as a walking trail, playground, and a pond. Oshino Hakkai is a touristy set of eight ponds in the quaint town of Oshino nearby Yamanakako. These eight ponds are spring-fed, full of fish and plant life and are well worth the trip. The water is said to have filtered through the slopes of nearby Mount Fuji through porous layers of lava for over 80 years. There are also many small shops and restaurants where you can try the local delicacies and soak in some Oshino culture. A working farm, and you can work too! Milk the cows, feed the animals, ride horses or enjoy a snack on their terrace or in one of their hammocks. Don’t forget the bug spray! ​Onshirin Garden is surrounded by beautiful red pines and Japanese larches. At Onshirin you can enjoy a beautiful western style garden, a lawn area that is perfect for a picnic or group games, rentable BBQ facilities, a large playground for children and a herb garden. There is a 7-11 located approximately 1km from the center down by the lake. Tourists and locals gather at this community plaza for a variety of events and activities. Kirara is equipped with a large children’s playground, a soccer field made of artificial turf, night lit baseball diamonds, tennis courts, and natural grass open spaces. Around the fields, there is a cycling path and you can circle Lake Yamanaka. There are several establishments around the lake where you can rent bicycles. 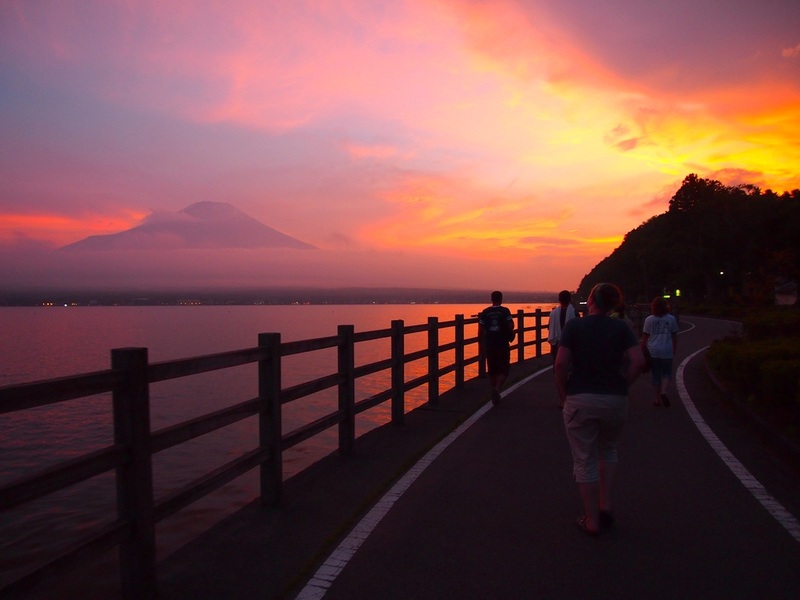 Yamanaka Lake has a great biking bath that encircles most of the lake. Torchbearers Yamanakako also has a limited number of mountain bikes available for rent. Please inquire with the office if this interests you. The Yamanakako public library is a lovely place to catch up on the news or read a good book. They have a small selection of English books and newspapers. Also you can enjoy free Wi-Fi. The library also has and two seminar rooms that are available for rent by your group. A reservation is required and eating is permitted in these rooms. This is a great place to stop of lunch prior to check-in if you plan to arrive early in Yamanaka.